These are a few things I take everywhere I go and use everyday. I love them all so much. I probably couldn’t live without them. Pink and black Skull Candy earphones – Skull Candy. I cannot live without my earphones they go with me wherever I go. A5 Notebook – Paperchase. A notebook is always needed to jot ideas I get for my blog and just to doodle sometimes. USB – WH Smith. My USB has got everything on it so it comes with me along with my super cute key rings ft. Jessie J and Shenice. MUA cover and conceal concealer – Superdrug. This is not the best concealer but its good for on the go so I take this one with me. Maybeline baby-lips – Superdrug. I have very dry lips so I carry this around to ensure my lips are always hydrated. Diesel Fuel for life 7ml – The fragrance shop. This perfume smells so nice. I love it. It’s nearly all gone so need to invest in another one soon. Peppersmith mints and Chewing gum – Peppersmith. As you may know I’ve had braces for half my life and had them taken off in September last year so its essential I keep my teeth clean and white as I had them whitened so I carry these mints around which freshen my breath aswell as being healthy for my teeth. Coral and white purse – New Look. I bought this purse last year I think so they probably don’t have it anymore but I need this always obviously. Pens – Eurooffice. I obviously need some pens to jot my ideas down with these are super cute and my favourite colours. 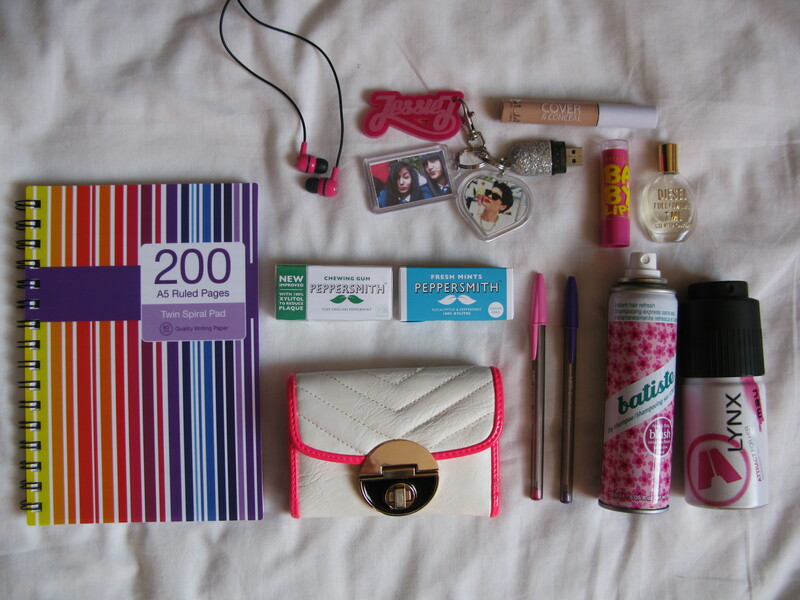 Batiste dry shampoo – Boots. This is my favourite hair product in the entire world – I LOVE IT! I take it everywhere it adds volume to my hair also keeping it looking fresh. Lynx Women – Boots. This body spray I take everywhere it smells lush. What are your essentials? Comment below. « March – I love it, I want it! I always keep a small makeup bag with me with lipstick, concealer and wipes with me! My headphones for lunch breaks in work to watch Netflix and of course my purse! Couldn’t live without any of these!